Remote malfunction I got a new wii console one week back. Was using it normally for one week. Suddenly no connection between the remotes and the screen. Tried changing batteries and re synchronising which are not working. It seems that no connection is established. The link is not appearing on the screen. Please help. Solved the problem. Took out the sensor bar inverted it few times and there it goes!! I think there was some kind of loose connection within it. Now it works well. One more trick worth trying!!!!! Solved the problem. Took out the sensor bar inverted it few times and there it goes!! I think there was some kind of loose connection within it. Now it works well. One more trick worth trying!!!!! Do the LEDs light up when you press the buttons on the Wii Remote? Try simply turning off the console, and pressing the power button a couple times firmly on the Wii Remote. If it turns on the Wii, the connection should be established. If it doesn't turn on the Wii, some hardware is defective. Recommend calling Nintendo Support if this happens. If the cursor is not appearing on the screen, but the Wii Remote is connected, then the problem is with the Sensor Bar, which should be above or below the TV (remember to change the settings in the Wii when changing sensor bar location). The Wii Remote must be in sight of the sensor bar for the pointer to appear on the screen. If the cursor is not appearing on the screen, but the Wii Remote is connected, then the problem is with the Sensor Bar, which should be above or below the TV (remember to change the settings in the Wii when changing sensor bar location). The Wii Remote must be in sight of the sensor bar for the pointer to appear on the screen. What do u mean by invert the sensor bar???? ONE TIME MODE - This mode allows you to temporarily use your remote on a Wii console other than your own, or to use a friend's remote on your console. It can also be used to change the order of the Wii Remotes, without the need to turn off the Wii console. One Time Mode does not delete the Standard Mode setting stored in the Wii Remote. In this mode, the Wii Remote will only communicate with the Wii console while the power is on. When the power is turned off, the Wii Remote will lose its sync with the Wii Console. For instructions on One Time Mode setup, please click here. Press the 1 and 2 Buttons at the same time on the Wii Remote that you want to synchronize with the console. If you are syncing multiple Wii Remotes, press the 1 and 2 Buttons on each Wii Remote immediately (without a significant pause) in the order you want them synced. The order in which you synchronize Wii Remotes determines the player order (1 through 4) for multiplayer games. The Player LED will blink during the syncing process. When the blinking stops, the connection is complete. Wii remote wont connect ? if it wont sync after using the red buttons then its just bad batteries from the sound of it or the remote has gone bad. Press and release the SYNC button on the inside of the SD Card compartment on the console. Press and release the SYNC button just below the batteries on the Wii Remote. Press the red button by where the batteries go in the remote and the red button by the memory card slot together and they should find each other and synchronise properly. If they ever lose synchronisation again just repeat the process. My wii counsel turns on fine, my remotes are with new batteries and flash when pressed the red light, but yhe remotes don't seem to be able to connect to the screen? STANDARD MODE - The Standard Mode procedure is used when adding additional Wii Remotes to your system or if you want to re-synchronize your original Wii Remote. Once synchronized, the Wii Remote will stay synced to the console unless you overwrite the settings by syncing the remote to a different console. For instructions on Standard Mode syncing, please read below. This normally happens when the battery,s in your Wii remote are low. Try a new (fresh) set of battery's. The alkaline type works best!! is your wii remote sinced recently??? Getting the Wii console to recognize (or "sync" with) a Wii Remote, especially one that did not come in the box with your Wii console, may require doing a few additional steps before it can be synced. Additionally, a Wii Remote that was working, but is no longer being recognized (or has "lost its sync") may need to be re-synced. Please use the troubleshooting steps listed below, which our experience has shown can solve many Wii Remote issues. Turn the Wii console power OFF by pressing the POWER Button on the front of the console. Unplug the power cord from the wall outlet for a few seconds. After a few seconds have elapsed, plug the cord back into the wall outlet. Turn the power of the Wii console ON. When you see the Health and Safety screen, open the small flap on the front of the Wii console to find a red button labeled "SYNC." Press and hold the SYNC Button down for 15 seconds. This will clear all the syncs on the Wii, allowing you to get a clean start to begin the process described below. With the first Wii Remote you wish to sync, remove the battery cover on the back of the Wii Remote to find a small red button just below the batteries. Press and release the small red button just below the batteries on the Wii Remote; the blue lights on the front of the Wii Remote will blink. 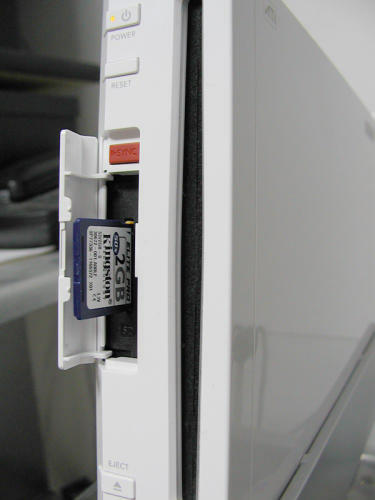 Quickly press and release the red SYNC button on the inside of the white flap on the front of the Wii console (picture below). This sync procedure (steps "a" through "d" above) must be followed for each additional Wii Remote added to the system.